I have suggested an edit on the tag wiki of circulant-matrices, based on a related tag wiki for hilbert-matrices. While typing the code, I observed that \\ is interpreted as \ in the preview. This gives incorrect output. 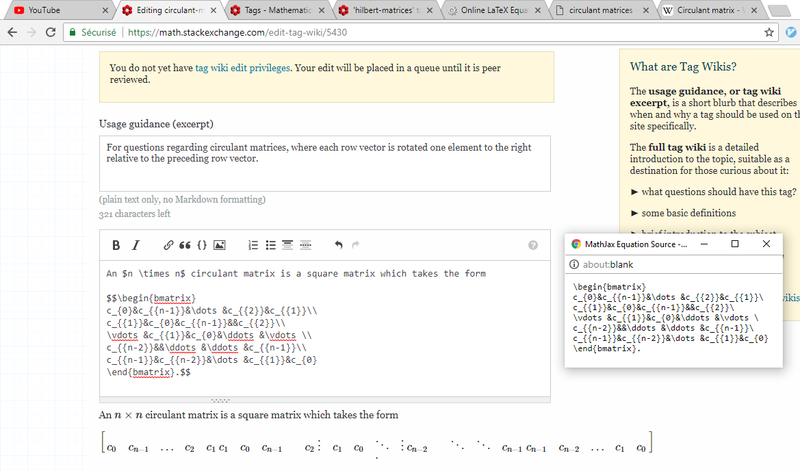 Browse other questions tagged bug mathjax tag-wikis markdown-preview editor . Enabling tag links in wiki excerpts? Tag wiki edit approved twice? Tag wiki edit: [algebra-precalculus] includes simplification.